Your pendulum will be unique. No more than three of a kind will be produced in each of our "Limited Edition" series. This means the pendulum you choose will truly be yours. Once a design is sold-out, it will never be produced by us again, a true collectors item. Some pendulums are marked with OAK -- and that means "One of a Kind." There will never be another made like it. Often these pendulums have very rare components we've picked up at estate sales or by the side of the highway or....somewhere else. Quality components. Swarovski crystal, quality pewter, sparkling glass and beautiful chain. Every pendulum we produce is designed to give you an item of beauty and elegant function. Your Magic Pendulum by Sheree will be a prop you will be proud to own. Old Style Craftsmanship. Each pendulum is a hand-crafted prop, designed for you. You and your pendulum will do many shows together in the years to come. You need to count on your prop. We understand. (We're performers too.) Both Sheree and I look over each pendulum before we ship it to you to ensure that it is perfect. Honest. A Certificate of Authenticity Your Certificate will tell you what date your pendulum was created upon and be certified by Sheree as one of her creations. 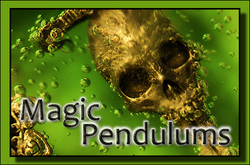 You will also have information on how many of these pendulum designs have (or will be) created. Your Choice of Shipping. We ship small packet Air Mail unless you want us to send it by courier or with a Tracking Number. Small packet air mail means no tracking number and no insurance. It's much less expensive -- and MOST of the time there's not a problem. Usually you'll get your new pendulum within ten working days in most areas of the world, although the post office will only guarantee delivery within two months. We ship all pendulums within 24 hours of getting your order...but please understand that once it's left our hands there's little we can do to hurry it along -- much as we'd like to. Each pendulum is slightly different, but as a rule of thumb: shipments to the US and Canada are $5.00. Shipping to the UK is $10.00. If you want it sent with a tracking number and $100 insurance, you can safely double the shipping fees ($10 US and Canada and $20 to the rest of the world) AND if you want it Express...well...let's just say you'd REALLY have to want it FAST...because those rates are just plain stupid. A Word about "Limited Editions." Here's the wonderful...and the awful part of making limited editions. When they're gone...they're gone. While we expect to keep this website as current as possible, there may be occasions where you purchase a pendulum that is already "sold out." So here's what we'll do (and we're open to ideas if you have a better plan) if that happens. We'll refund your payment right away and give you advance notice on new designs that are similar but NOT identical to your first choice. In either case, you can expect to get an email from us with confirmation that you own the pendulum...or telling you that it's been sold to someone else...within a few hours of your purchase. If you'd like additional pictures or details...please ask! You're not buying a bag of chips. You're purchasing your pendulum. It's something very personal. Those of us who use pendulums in our shows, use them a LOT. And most of us would readily admit that you develop a kind of a relationship with your pendulum. I'm not talking about spooky-noises-coming-from-the-closet stuff. But most of us get to know these great props very well. We completely understand that the pendulum has to fit YOU. So ask questions or ask for photos. We'll do our best to ensure you have all the information you need to choose YOUR pendulum.